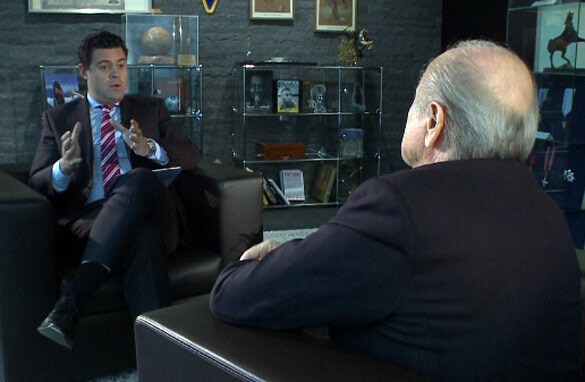 Before the storm: CNN's Pedro Pinto interviews FIFA president Sepp Blatter in Zurich on Wednesday. Wow. What a day. When it started, at 7 a.m. in Zurich, I had no idea our interview would be the most talked about sports news headline of the day. Last week, we had arranged an interview with FIFA president Sepp Blatter to talk about the new reforms against corruption at football's world governing body and the countdown to the 2014 World Cup in Brazil. Other topics I wanted to discuss were the decision to release the ISL documents linked with past acts of alleged corruption, and racism on the field of play. The latter had been intensely discussed in England after two players were accused of alleged racial abuse in two Premier League matches and I wanted to get his take on it. The interview started at 9 a.m. at FIFA headquarters and I knew I had 20 minutes with Mr. Blatter. CNN producer Chris Eldergill and I had prepared the topics well and I started by talking about how tough the last 12 months were for him and FIFA. We then moved onto the reforms he wanted to introduce, and we only had a couple of minutes left when I asked the racism question. And let me be clear, my question was: "We have discussed racist behavior of fans before, but recently there have been some players accused of racist abuse on the field of play. Do you think there is racism on the pitch?" Mr. Blatter told me he believed there wasn't. He said that many things are said during a match that players don't mean, so it shouldn't be taken personally. He then added that at the end of the match players should shake hands and move on. In his many years of experience in football, Mr. Blatter has spoken with players, coaches and officials about the atmosphere on the pitch and how intense it can get. I myself have been to hundreds of games and have heard players say the most nasty things to each other. He believed that at the end of a game, footballers realize that many things are said in the heat of the battle and don't take offense to them. Therefore, they should be able to shake hands and move on. After further reflection, I realized a man in his position could not be so dismissive of the subject. Especially when it was being investigated in one of the biggest leagues in the world. He had to take a stronger stance. So, we wrapped up the interview and shortly after started to break down all the cameras and lights because we knew we were on a deadline. We wanted to get the interview back to our newsroom as soon as possible, especially because there were other television channels that were going to be speaking with Mr. Blatter later that day. We also had a flight four hours later so, in order to be productive, Chris arranged with FIFA to work in one of their conference rooms. We edited the 20-minute interview into a five-minute block and sent the piece to our World Sport producers back in Atlanta. Then, we asked our colleagues in London to transcribe what the FIFA president said and send it to the main news outlets. As we listened to the final version of the interview, we wondered how people would react to what Mr. Blatter said about various topics, especially racism on the field. I knew what he meant, but thought he should have said that FIFA were committed to fighting racism on and off the pitch. I suspected this might be the line a lot of people would pick up on. I was right. As news started making its way around media outlets in England, there was only one topic they were talking about: Racism on the field. On the way to Zurich airport, we started to be bombarded with emails and tweets about the interview. I think I got at least 200 new Twitter followers in the next hour. I got messages from all over the world, even one from Manchester United defender Rio Ferdinand. It was unbelievable. The stream of communication continued and before we knew it, our interview was on the BBC, on Sky and on ITN in the UK. It was bad timing for Mr. Blatter because his comments came on a day the English Football Association decided to charge Luis Suarez with alleged racial abuse during a match against Manchester United. Later that night, when I finally had time to think about everything that had happened, I have to tell you I had mixed feelings. On one hand I was glad to have our interview quoted around the world, but I also felt the other topics we discussed in the interview should have been mentioned. CNN's World Sport showed the whole interview, but most other outlets didn't. So there you have it. My take on what was truly a crazy day. Blatter reminds me of his good buddy Robert Mugabe – full of it!! There is no place for in any sport for racism, sexism etc. Blatter and his FIFA cartel are destroying soccer and one way or another, an alternative governing body, cannot come soon enough. Sounds to me like you got more than you bargained for and didn't realize what you'd got. If ever there was a need for a follow up question this was the time. Blatter should have been asked to clarify his statement because what he said was not only ignorant but arrogant as it stated that football has beaten a problem that society as a whole has not! Blatter haters are clearly revelling in that faux pas, but, to be fair to the man, I think he should have been given a second bite at the cherry as I don't believe what came out is what he really meant to say. We all know that FIFA has been working on its anti-racism policy and what I believe he meant to say is that football is not rife with racism and that one or two debatable incidents do not equate to an epidemic. The question now - will your accidental scoop finally bring the man down? Iam still in hangover from what Blatter said..there is this truth existing between the lin, the first is maybe Mr Blatter is'nt aware of the whole issue of racism despite of the desk top job he has been doing to fight it or he does not have a clear concious on major issues troubling the soccer game...but the day the abused person loses his nerves and do the damage maybe he will have atleast a clue of the issue. That interview on World Sport program with a south American guest, trying to justify the use of the word Negritos as a none derogatory word in South America is simply a whitewash ! Using such a word repeatedly as alleged in the UK, during a competitive situation cannot pass for a friendly gesture as the interviewee tried to claim. Why don't we just allow the police to do their job in this case ? Instead of trying to justify the unjustifiable ? I have NEVER been a supporter of Blatter and every one of these stories that come up on him only serve to confirm my opinion. Pedro – you and your colleagues should not relent on this story nor any other aspect of how this incompetent man is damaging football's reputation. Pedro Pinto was absolutely useless as usual. Instead of patting Blatter on the back as well as his seat he should have torn into him. The fact that he didn't makes me wonder how much he agrees with Blatter. Hey guys! What's up about all these racism and tribalism things? What I know for sure is that, any body who things of himself better than another would have a very tough time in Heaven where every body is seen by the Almighty Creator as equal and as such would be judged. WHEN I COMTEMPLATE ONTHOSE PEOPLE WHO ALMOST SPRING AS THE WALK (AS A SHOW OFF OF WHO THEY THINK THEY ARE ON RELATIVE TERMS) I IMAGIN HOW DISAPPOINTED THEY WOULD BE IN HEAVEN WHERE HUMILITY IS THE ORDER OF THE DAY. I think this issue has no real confirmation. Сorruption was everywhere where there is money and power. so where is the actual video. hate it when you guys always wanna tell ppl wha to think. yall need to release the video. he claims he was misquoted, so where is the evidence.lets face it America and England esp. England are still not over the lost of that hosting bid. yall need to get over it and leave the old man alone. The best thing Sepp Blatter could do for football is resign. What we saw was an interview with someone with so much to hide that he does not know how to tell the truth anymore. Blatter could not give the needed answer to the racism question because at the hint of something negative he immediately went defensive and said everything was ok. Well Mr. Blatter, everything is not ok. There is racism on the pitch, there are players and referees being bribed, there are FIFA officials on the take, and the World Cup has been awarded to a country with an average summer maximum temperature of over 40C . In fact it would be more correct to say everything is wrong and the manager of this mess should take responsibility for his failures. Saying that there is no racism in sports when we have seen over the years people making monkey noises and throwing bananas on the field was bad enough, but anyone who truly and honestly believe racism is totally unacceptable (whether in sport or in society) would never have given such an answer i.e. it can be settled at the end of the game with a handshake. Punishments/sanctions that FIFA has dished out in the past have never come anywhere close to fitting the crime, and now we all know why. Is it not said somewhere: "Human beings are made in the image and likeness of the Creator " ?